Upon completion of this online learning course, you will be able to identify the five conflict-handling strategies. This module should take you 10 minutes to complete. Do you believe this is the definition for conflict in the workplace? A state of discord caused by the actual or perceived opposition of needs, values and interests between people working together. Conflict researchers often use dual concern theory to describe people's conflicts management strategies. Dual concern theory considers two aspects. The degree to which one tries to satisfy the other person's concerns. The degree to which one tries to satisfy one's own actions. Imposing one's will on the other party. Forcing is a win-lose situation. Trying to reach an agreement that satisfies both one's own and the other party's aspirations as much as possible. 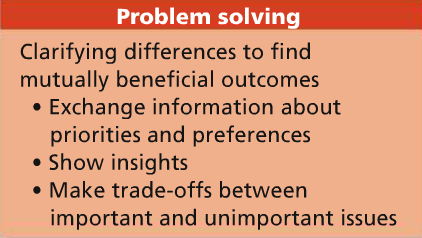 Problem solving seeks a win-win solution. Ignoring or minimizing the importance of the issues creating the conflict. Avoiding conflict and pretending it does not exist, can yield a lose-lose situation. Accepting and incorporating the will of the other group. Yielding is a win-lose solution. Balancing concern for oneself with concern for the other party in order to reach a solution. Compromising so that neither person gets what they want, which can be a lose-lose situation. Accepting and incoorprating the will of the other party. Trying to reach and agreement that satisfies both one's own and the other party's aspirations as much as possible. 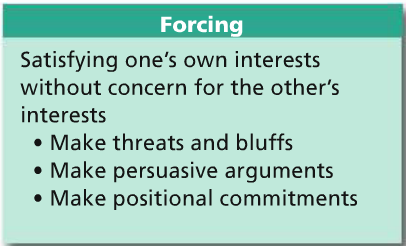 Forcing is part of a situation. Problem solving is part of a situation. 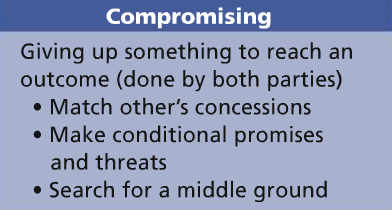 Compromising is part of a situation. Avoiding is part of a situation. Yielding is part of a situation. Great job on completing the course. You now know how to manage conflict in the workplace. Breward, K., Langton, N., Judge, T., Robbins, S. (2016). Organizational Behaviour. In Pearson Canada Inc. (Eds. ), Organizational Behaviour(314). Don Mills, Ontario: Pearson.